This world has its own Socrates and Plato (a pair of classical philosophers named Thelenes and Protas, who challenged a troupe of freelance rhetoricians similar to the sophists) and equivalents of basic principles like Occam’s razor, the Pythagorean theorem and the parable of the cave presented in Plato’s “Republic,” as if to show that such ideas are so fundamental to intellectual development they must arise in any thinking society, regardless of its history. Whether you are able to keep track of the differences between these factions (there’s a helpful glossary at the back of the book for dopes like me), it doesn’t obscure Stephenson’s larger point, perhaps the most resonant and consequential in all of “Anathem”: the absence of religion does not prevent passionate and violent disagreements over theoretical matters; such conflagrations can occur even in societies that hold rational thought as their highest virtue. So far, so good, but here comes the heresy. Eventually, Erasmas spies what he thinks is an alien ship in the sky, leading to his dismissal from his monastery and finally setting the plot of “Anathem” in motion. 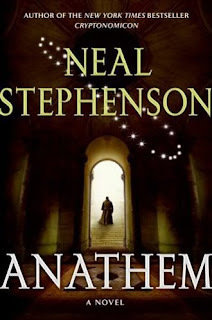 While his narrator is engaged in his wanderings, Stephenson amuses himself with other interpretations of worship: a faith based on an ancient craftsman and his vision of a triangle in the heavens, and another structured around the unlikely trinity of a condemned man, a magistrate and an innocent girl. 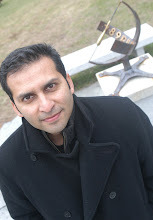 And my reluctant conclusion is that “Anathem” spends so much time engaged in copying, in conjuring up alternative formulations of our real-world science and religion, that it forgets to come up with much that is new or true. This may still be good enough for people who are interested in issues surrounding science & religion interactions. Read the full review here.